Try here for various preload adjustment shims. 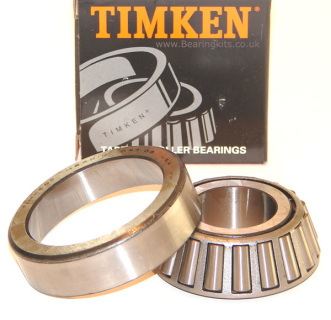 New high quality TIMKEN bearing at a low price, there are two of these bearings per Pinion, ie two will be needed if you want to change them both. 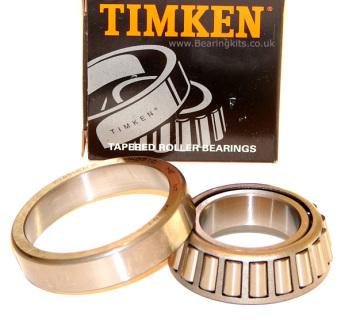 TIMKEN Differential carrier bearing for Ford English diff. High quality TIMKEN differential carrier bearing to fit the english diff unit. Ideal to use if fitting standard Limited Slip DifferentialS like QUAIFE or TRAN-X. You will need two bearings for a new diff, it is not a good idea to replace one at a time. Please note some LSD units will use a larger bearing if they have larger spline halfshafts. High quality NTN (USA) diff carrier bearing for English diff, good quality and a little cheaper. Two needed per differential carrier. SKF Taper roller bearing for Ford English diff pinion. Here you have the bearing that was commonly used by Ford when the diff was built, the advantage of using the SKF bearing is in the setting up. SKF bearings will generally set up easier than others without much adjustment required. They do cost more than others but this cost can often be offset by time. In my opinion these are the best you can get. Two bearings needed per pinion. SKF Taper roller bearing for Ford English differential carrier. As above but for the Differential carrier, highest quality SKF bearing suitable for standard diff carriers and most QUAIFE / TRAN-X type LSDs. 2 bearings need per differential.